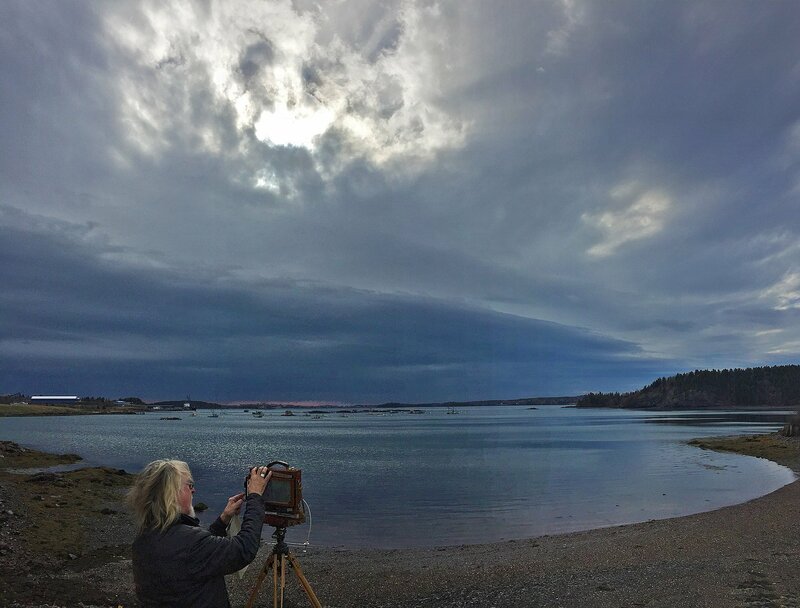 Photographer, Thaddeus Holownia, with large format camera at Broad Cove, Eastport, Maine. For nine years, TIMA sponsored an extended study of Eastport’s architecture, landscape and community — the first serious, in-depth, broad look at a community’s architecture along the eastern coast of Maine. The study was led by architect and architectural historian, John Leroux of Fredericton, New Brunswick and photographer, Thaddeus Holownia of Jolicure, New Brunswick. Leroux is the author of seven books on New Brunswick architecture, including Building New Brunswick: an architectural history, St. Andrews Architecture: 1604-1966 and most recently Glorious Light: the stained glass of Fredericton. Holownia recently retired as long time Professor of Art and Department Chair at Mount Allison University in Sackville, New Brunswick. More than a thousand large format photographs were taken by Holownia for this project including interiors and exteriors of buildings, wider streetscape and landscape views, and a whole series of portraits of trees. A series of six thematic written essays provide context for the photographs. The study led to a book publication of Eastport in 2018 containing 216 pages and 175 photographs. The book launch took place on Thursday, August 23, 2018, 7 pm @ TIMA’s 1829 Seaman’s Church Building, 26 Middle Street, Eastport, Maine. Both Thaddeus Holownia and John Leroux presented talks at the launch. Copies of the book can be ordered through this link: Eastport. John Leroux writes: “The irony is that even as our world becomes more pluralistic, specific corners are becoming less unique and distinctive. Far too much of North America is evolving into the same amalgam of highway exits, coffee chains, slick boutiques, and strip-malls. Communities that manage to hold onto their social and material heart become irreplaceable. They testify to our ability to conceive beauty and to form exceptional spaces that connect and inspire. This is why Eastport matters.